Before I go into my love for “Best Worst Movie”, I need to give some of you out there that are not familar with the cult of “Troll 2” a little background info. “Troll 2” was a 1990 horror film directed by Claudio Fragasso (under the pseudonym Drake Floyd) and starring Michael Stephenson, George Hardy, Margo Prey, Connie Young (here credited with her maiden name, Connie McFarland), Deborah Reed, and Jason Wright. Although produced under the title Goblins, United States distributors were skeptical about the film’s ability to succeed as a standalone picture and renamed it Troll 2 in an attempt to market it as a sequel to the 1986 Empire Pictures film Troll. The two films, however, have no connection, and no trolls are actually depicted in Troll 2. The plot concerns a family pursued by vegetarian goblins who seek to transform them into plants so that they can eat them. The English-language script was written by Fragasso and his wife Rosella Drudi, neither of whom actually spoke any English at the time. Despite filming the movie in Utah, and casting the movie entirely with American actors (many of whom had no prior acting experience and had responded to the casting call hoping to be extras), Fragasso also employed an exclusively Italian crew, who likewise spoke no English. The resultant communication breakdown, coupled with the cast’s lack of experience and Fragasso’s insistence that his script be read verbatim, has led to the movie being considered one of the worst movies ever made. Which all leads us to our movie of the day, the strangely poetic “Best Worst Movie”, a doc that revels in the notion of what is and is not considered a “bad” film. 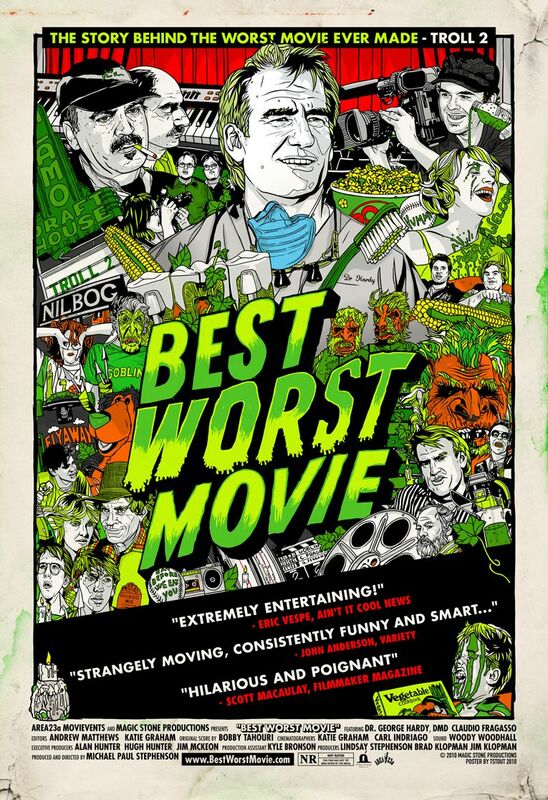 Probably the most heartfelt doc I’ve ever seen, “Best Worst Movie” examines the perspective of a “bad” movie from all angles. From the fans to the filmmakers to the cast, everyone talks about their experience. It’s a really sweet doc that I wasn’t expecting to find much weight behind but it’s one of the best experiences watching a movie that I’ve ever had in my life. Just because something is “bad” doesn’t mean it can’t or doesn’t deserve to be loved.